It is as if we are just watching lots of unfunny scenes of these people without any real story or problem. There’s nothing terrible about this movie, other than that it is a pretty big waste of time. it’s not funny and it’s certainly not interesting. there is no real problem or story at all, and instead, we are just watching characters deal with little annoyances. Pete has some career trouble. Debbie feels like she’s getting old and doesn’t like it. that’s the best that this movie has got to offer. a cameo by Seth Rogen or Katherine Heigl would have been nice, but it really wouldn’t have made a difference in this lousy film. This Is 40 is a pretty lousy movie. it’s the sort-of sequel to knocked up, which really just means that it’s a full movie about two characters who were not the main stars of Knocked Up. instead, they were side players, and now they have a whole movie to themselves. sometimes that formula works, like it did for Get Him To The Greek (which used the Russell Brand character, Aldus Snow, from forgetting Sarah Marshal), but more often it doesn’t. that’s because it’s a spinoff from something that already worked, and actually has less chance of being good than a sequel. With a sequel, you are watching a follow up movie to a film that you loved. You already know that you like the characters, and by going to see the sequel, you are getting to reunite with them and spend more time with them. now all of that sounds great, but the truth is most sequels don’t work. That’s because we’ve already seen the movie in as good a format as it’s going to get. we saw it be great, so what is where left to do? The few sequels that do work better than the original (Terminator 2, Aliens, and the Godfather Part II), only work because they are vastly different then the first film. If the odds of a sequel working are very slim, then the odds of a spinoff working are even less. After all, these are characters that weren’t even strong enough to be the stars of the first film. And now we are supposed to believe that because the actors who were side players in that first go around, have now become bigger stars, that it means they should reprise their roles into a feature length film. It’s a pretty ridiculous notion. Steve Carrell learned that when he reprised his role of even Baxter from Bruce Almighty in the film Evan Almighty. Needless to say it was an awful movie. 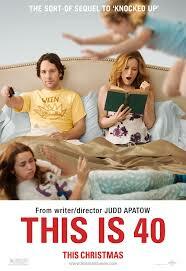 With This Is 40, it is Paul Rudd and Leslie Mann reprising their roles as Pete and Debbie. these were the older, wiser characters in knocked up, the married, family-driven people. if Superbad was the high school version of the characters in knocked up (it isn’t, but seems to exist in the same Apatow universe, as it was written by Seth Rogen, came out the same year as knocked up, and I believe Rogen would have played the Jonah Hill part if he still looked anything like a high schooler), and knocked up was the middle movie, then this would be the third and older film. these characters are the least interesting and in the least interesting time of their lives, of the three movies. In Knocked Up, we got to see Pete and Debbie has problems. There was a situation where Pete was sneaking away at nights to go play with his friends in a fantasy baseball league. He would lie to Debbie about it, telling her that he was going to see a concert for work. That situation was pretty cool, but mainly because it was only a tiny segment of the movie. We have to spend a little time watching them have a problem and then the rest of the movie was about Seth Rogen and Katherine Heigl having a baby. Now, we get a full movie of problems like that. Not a good idea. To make matters worse, not one problem in the movie is even close to as interesting as that one. This movie is all filler. There is no story, no single problem, and no real development. I sat there watching this and halfway in I realized that nothing was changing. Nothing was actually happening at all, other than the oldest daughter might or might not finish out watching the series lost. It is actually ridiculous. The show lost is shown or mentioned about ten times in this film, as if Judd Apatow has some kind of a stake in that TV series or something. Now, to it’s credit, this movie isn’t exactly painful to watch or anything. While nothing of any importance happens, it still does hold our attention, although I am still not exactly sure how. I suppose it is just the likeability of these actors. This movie definitely works better than Apatow’s last directing effort, Funny People, and that had both Seth Rogen and Jonah hill in it, not to mention Adam Sandler. However, the problem with that movie was that it was too serious and depressing. At least This Is 40 does not make that mistake, and tries to be a comedy. The problem is that nothing in the movie is very funny. You can get by with a movie that does not have a great plot, so long as the film makes people laugh. This one does not. There are maybe three jokes in the film that really work and the rest are just smile-worthy at best. That is of course better than cringe worthy, but even still, it is nothing great. As fast as the plot goes, Pete’s big problem is that he has signed an elderly rock star that was once something big, but now cannot sell out a tiny bar. People just do not care about the guy anymore, and Pete has put a lot of money into the man’s new album and tour. It is a disaster. Debbie’s problem is that she feels like she is getting old. She refuses to admit that she has turned forty. Neither one of these problems is very interesting at all. The best thing about the movie is the few scenes that involve Jason Segal, Meghan Foxx, or Chris O’Dowd. These three are the real movie stars of today, or at least the younger ones, and the actors all have natural talent (even if Foxx’s is simply her looks.) there is a pool party scene in the second half where these three spend a few moments together and we get a glimpse of what the movie could have been if they were the stars. Then again, maybe they are just serving the purpose that Pete and Debbie did in Knocked Up, funny in a small dose, but not feature film material. Either way, Pete and Debbie do not have anything going on in their lives that is worthy of a movie, and this film really didn’t need to happen.